1. Open Windows Explorer and navigate to the folder in question. Let's say it's called "Client Files" (which is exactly the name of the folder Jim's after). 2. Right-click the folder and choose Send to, Desktop (create shortcut). 3. Now minimize all open windows and find the newly created shortcut icon on your desktop. It'll be labeled Client Files - Shortcut. 4. 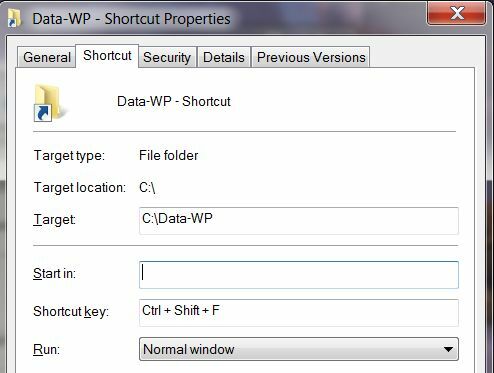 Right-click that shortcut and choose Properties. 5. Within the Shortcut tab, click inside the Shortcut key field. 6. Now you have to decide what keyboard shortcut you want. It could be something like Ctrl-Shift-F or Ctrl-Alt-Q. I recommend using some combination of Ctrl-Shift, Ctrl-Alt, or Shift-Alt, just to avoid conflicts with other programs (which are more likely to use just one of those keys). For sake of argument, let's go with Ctrl-Shift-F. Press that combination, and you'll see it appear in the Shortcut key field. 7. Click OK to complete the process. Now, whenever you press Ctrl-Shift-F, even when using another program, your Client Files folder will magically appear. By the way, you can use this method to quick-launch favorite apps as well; just right-click a desktop shortcut and repeat the process.